In recent years, cancer researchers have developed an exciting new type of treatment called immunotherapy. Typically, cancer cells use protective barriers to prevent the immune system from attacking and killing them. However, immunotherapy has the ability to break down these barriers, so a patient’s immune system can work the way it’s meant to and kill the cancer. Experts are still discovering which cancers respond well to these new treatments, but several cancers, including non-small cell lung cancer, have proven to work well with immunotherapies. Immuno-oncologist Louis M. Weiner, MD, offers these tips for patients living with lung cancer. Immunotherapy has great benefits—but doesn’t work for everyone. When immunotherapy works, it has the potential to have an absolutely transformative impact on a patient. For those patients with success on immunotherapy, the outcome is fantastic and they find themselves free of cancer for a very long time. However, I always tell my patients, before we start immunotherapy, that they should hope for the best but to be mindful that immunotherapy doesn’t work for everyone. It’s hard to say that; we’re still studying why immunotherapy works for some people but not others. Although the treatment may not be effective for all, when it does work, it works really well. So it’s worth trying if your oncologist recommends it. Lung cancer patients on immunotherapy should monitor side effects closely. Side effects for immunotherapy are different than those of traditional cancer treatments like chemotherapy and radiation. In some cases, immunotherapy patients don’t experience side effects at all! But that’s not always the case. With immunotherapy, we’re activating the body’s immune system, and the bullets fired by the immune system aren’t always right on target. While side effects tend to be less severe than with traditional treatments, I make sure my patients are aware that they need to report all symptoms to their care team immediately, because we don’t always know what problems could turn out to be very serious. Patients should report diarrhea if it starts, as well as excessive fatigue, worsening cough, and shortness of breath. Patients with lung cancer are already at risk of respiratory problems, so it’s more likely that they experience related issues. These are all red flags that shouldn’t be ignored. We don’t yet know how long treatment with immunotherapy will be. Since immunotherapies are relatively new, we don’t have a full understanding of how long patients need to be on them. If immunotherapy works for a patient, we don’t know if treatment should be continued or not once the cancer is gone. Some doctors think we don’t need to treat for too long, that once we stimulate the body’s immune system, it will know what to do after that. Others are more conservative and want to see patients being treated for longer periods of time. Rigorous studies are currently underway to establish the optimal duration of treatment. 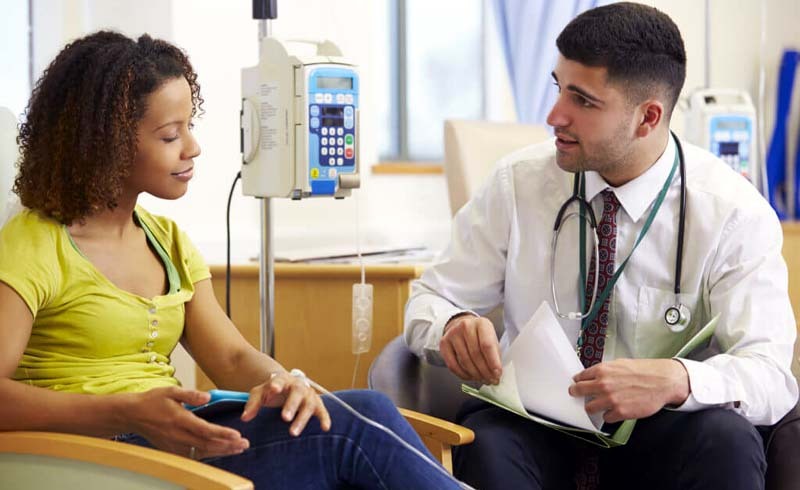 In the meantime, I tell my patients to keep an open mind—they may be treated for a short period of time, or they might take an immunotherapy medication regularly for a long time and manage their cancer like a chronic disease. If one immunotherapy medication doesn’t work, it’s possible another might. In some cases, an immunotherapy medication isn’t successful and the cancer continues to grow. But that doesn’t mean another immunotherapy or combination of drugs won’t work better. Cancers defend themselves against attacks in a variety of ways, and different types of immunotherapies work in different ways to break these defenses. If your immunotherapy doesn’t work, ask your oncologist about trying something new, including therapies being tested in clinical trials. Sometimes immunotherapies are effective for a while and then stop working—in these cases, too, patients may benefit from trying an alternative immunotherapy. There are several different immunotherapy drugs available to treat lung cancer, so patients have options. It’s very important that patients know research cures cancer. You should always ask your doctor whether there are any clinical trials available to you that may be helpful. Sometimes, there won’t be. But sometimes, there will be a great opportunity that could prolong your life. Patients need to be their own advocates and make sure their doctor’s recommendation is based upon a thorough evaluation of available options, and not based on convenience. That’s why second opinions are so important. Having another doctor review your case may give you peace of mind that you’re on the right path, or it might lead to a recommendation for a treatment that could save your life.